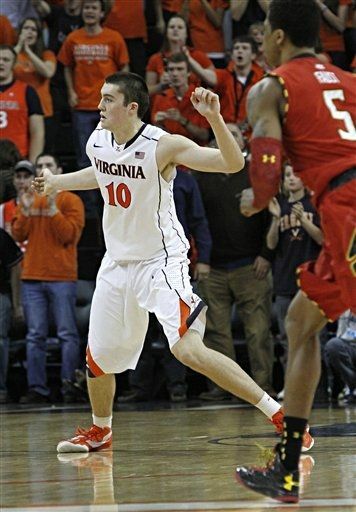 VIRGINIA 61, MARYLAND 58 - Mike Tobey's tip-in with 1:46 to play in overtime gave Virginia the lead and it held on to beat Maryland 61-58 Sunday night in a game the Cavaliers had to win to boost their NCAA tournament hopes. Tobey, who scored 13 points, tipped in a miss by Akil Mitchell to give Virginia (21-10, 11-7 Atlantic Coast Conference) the lead, and two turnovers and a missed 3-point try just before the buzzer by Dez Wells preserved the Cavaliers' 17th consecutive home victory and a first-round bye in the ACC tournament. Nick Faust led the Terrapins (20-11, 8-10) with 15 points and Wells finished with 12 and 12 rebounds, but despite leading most of the game, the Terrapins lost their fifth in a row against Virginia. Mitchell led Virginia with 17 points and Joe Harris had 15 despite making just 4 of 18 shots. Faust scored 10 of his 13 points during a 19-2 run early in the game and Maryland almost made it last, not letting Virginia get back to even until Harris' 3-pointer went through with just 1:37 remaining. Wells' floater gave Maryland the lead back with 23.8 seconds left, and Tobey tied it when he caught an inbounds pass, turned and laid it in with 5.4 seconds left. Justin Anderson blocked Maryland's final shot in regulation, and the teams traded baskets in overtime until Tobey's follow finished it. WAKE FOREST 90, VIRGINIA TECH 79. - Playing his last-ever game at the Joel Coliseum, senior guard and Winston-Salem native C.J. Harris made sure he went out in style--and with a win. Harris scored a career-high 29 points and went 6-for-6 from 3-point range to lead Wake Forest to a 90-79 win over Virginia Tech on Saturday afternoon. The Demon Deacons jumped out to a quick 9-0 lead to start the game and pushed their advantage to 14 at halftime and to as many as 24 in the second half. With the win, Wake Forest (13-17, 6-12 ACC) earns the No. 10 seed in the upcoming ACC Tournament in Greensboro. The Deacons will face No. 7-seeded Maryland on Thursday at 7 p.m. at the Greensboro Coliseum. Virginia Tech (13-18, 4-14) dropped to the No. 12 seed with the loss. The Hokies got 35 points from Erick Green, the nation's leading scorer, but could never recover from the Deacons' quick start. Wake Forest shot 61 percent in the first half, distributing the ball to tally nine assists on its 14 first-half field goals. The Deacons were 5-for-9 from beyond the arc in the half, led by Harris' 4-for-4 performance. For the game, Wake Forest shot 59.2 percent (29-of-49) for its highest mark of the conference season. The Deacons finished with a season-high 21 assists on the day.